The history of Shakespeare Bash’d, up to and including their current production of Macbeth at the Monarch Tavern, reveals a pattern of wonderful comedy and middling tragedy. Some of this has to do with the Fringe Festival comedies being shorter and more fun, enlivened by the festival environment. But, mostly, I think it comes down to the company’s “Shakespeare in bars” mandate that works beautifully for something like Love’s Labours’ Lost (which is essentially about frat boys) but doesn’t exactly elevate Macbeth. In the middle of Much Ado About Nothing, it’s nice to be able to stand up and order another drink. When someone does that during Macbeth, it immediately interferes with whatever ominous atmosphere the players have managed to conjure against the odds of their casual, comfortable surroundings. It’s a great mandate- bringing Shakespeare to unexpected and accessible locations- but it does present unfortunate limitations when the company tries to get more serious. That said, the smaller, darker Monarch is a far more suitable space than 30/30 Dundas and Macbeth a generally better production than last year’s Romeo & Juliet, despite a leading man who fails to match, let alone lead, his strong supporting cast. The bare-bones Bash’d style is ideal for the intimate, character-driven simplicity of The Scottish Play. With very few bold choices and zero bells and whistles, the production can sometimes take a bit too much of an enter-speak-exit-repeat formula but, when the best cast members are on stage, it’s an uncommon blessing to be able to just watch them work- no crutches, no distractions, just the actor and their text. Because of director James Wallis‘ dedication to simplicity, however, any weaknesses in the acting are immediately exposed. The lack of irresistible chemistry between David Ross and Amelia Sargisson, for instance, muddles the central emotional arc of the play while neither actor appears all that comfortable or natural in their title role. Sargisson’s best moments as Lady Macbeth come while playing the hostess, layering false charm eerily onto a Stepford-esque demeanour, though her soliloquizing lacks ruthlessness. Most unfortunate, however, is Ross who appears to be attempting to survive the pitfalls of the iconic antihero rather than contribute to his legacy. I appreciate the instinct to go back to basics but Ross doesn’t appear to have anything much to say about Macbeth as a man. The rest of the cast fares much better, though there’s only so much a supporting cast can do within this particular text without strong leads. 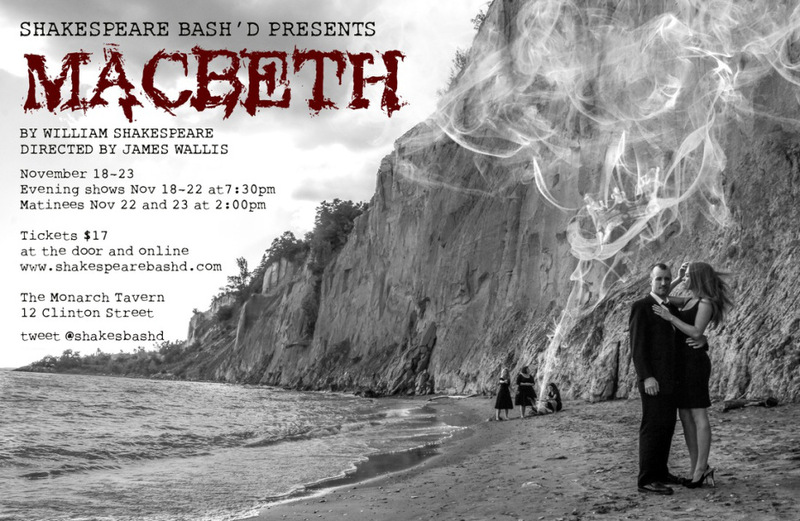 The production’s most effective scene is the often overlooked 4.3, wherein the play’s contrasting heroes Malcolm and Macduff join forces to rally against Macbeth. Alex Furber is an excellent Malcolm, playing the future king with gentility and grace that contrasts intriguingly with his harsh surroundings and bodes well for a happy ending. He’s met for the standout England scene by Kyle Purcell as the good soldier Macduff. In his previous roles with the company, Purcell has played sweethearts and pacifists; it’s a nice surprise to see the baby-faced actor really show off his range with a more mature role, straightening his back and putting up his guard. Casting an actor quite a bit younger than Macbeth and Banquo seems like a strange move for Macduff but Purcell gives him a fresh-out-of-the-academy intensity that really works with the production’s contemporary vibe and illuminates a new side of the character without extrapolating too much (Side Note: production MVP Purcell also made the poster which is so brilliantly moody and detailed I can’t stop looking at it). The youthfulness of Macduff is also reflected in his wife, played beautifully as a new mother by Maggie Blake. The restructuring of her murder scene is somewhat jarring (lines originally attributed to an older child are now her imagining a conversation with her babe in arms) but there is something deeply disturbing about seeing Macbeth join the murderers in person to take out Macduff’s family. Blake’s success with the single-scene role of Lady Macduff is part of a trend throughout the production of standout turns in small roles. Hallie Seline (who is also the best witch of the somewhat awkward trio) makes an unexpectedly delightful Fleance while Tim MacLean comes back from his nondescript Duncan to give a nicely understated performance as the Doctor in act five. The most notable example, though, comes from director James Wallis who cast himself as Seyton then made Seyton a far more important and interesting character than he usually is. By placing the act five flunky in earlier scenes as a servant and murderer, Wallis manufactures a relationship with the title character that is utterly compelling; he has very few lines but still manages to convey an inner conflict between heroism and survival, contemplating interfering with the action in the style of Cornwall’s First Servant, opting instead to silently stand by as the tragedy plays out. It’s genuinely bizarre to see a production where Seyton’s emotional journey far outstrips that of his master, but such is the price paid by a company that lets its best actor direct when their leading man is not up to the task (I know it’s frowned upon but surely one can direct themselves in a title role if absolutely necessary). If all parts were considered equal, this Macbeth would add up to a great sum, even if it feels misplaced in a bar setting. Unfortunately, all parts are not considered equal and a great Macduff and wonderful Malcolm can’t make up for a mediocre Macbeth, ever. As reductive as it sounds, a lot of productions live or die on decisions made in the casting room and someone here made a very wrong call. PS: For future performances, would someone please remember to smear the daggers with blood after the off-stage murder? It’s very confusing to have blood-covered hands and completely clean daggers.